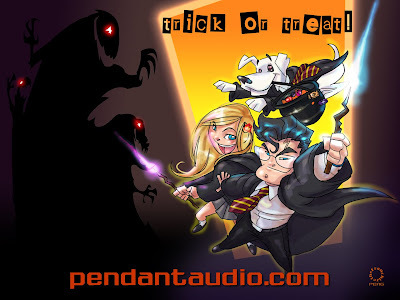 however i am not late in posting a wallpaper image that my hubby theFranchize & i collaborated on for PendantAudio.com. in case u didn't know, PendantAudio.com is the online radio show that he and i draw monthly covers for their Superman and Supergirl radio shows respectively. we couldn't pass up the chance to draw a wallpaper for Halloween for them since they asked. any reason to draw Supers is A-OK with us. =) it's on our desktop now so go ahead and slap it onto urs as well! (not much i can do about the web address at the bottom of it. that's something they added.) if u'd like to download other sizes of this or wallpapers done by other people, you can head on over to their site - http://www.pendantaudio.com/superman.php - and click on LET ME SEE SOME SUPERMAN ART! in the pink box in the middle.